Home / Unlabelled / ISIS arrests: How many are from travel ban countries? ISIS arrests: How many are from travel ban countries? (CNN) They called it the "US Project." Their goal, allegedly, was to carry out an ISIS terror attack on New York during Ramadan that would "show them what they hadn't seen in 2001." "NY needs to fall," wrote Talha Haroon to an undercover FBI agent. "It's a must." The three participants discussed planting explosives on subway trains, detonating a car bomb in Times Square and gunning down concertgoers in a mass shooting, according to recently unsealed court records. They even looked at concert listings for shows at indoor venues far from police stations. "I'm mad excited," Haroon wrote, according to the criminal complaint. "And may Allah cause great destruction to the filthy kuffars (non-believers) by our hands." They all lived outside the United States, so one of them rented a cabin near New York where they could build bombs, practice target shooting and coordinate logistics. "I wanna kill them in the thousands," Haroon wrote, according to the complaint. "We have to make an ocean out of their blood ... I wish we had someone to record their terrified screams." Stories like these, coupled with a wave of terror attacks in Europe, have heightened the fear that ISIS militants around the globe could be prepping to execute attacks on US soil. One of President Donald Trump's first major actions after taking office was signing an executive order placing temporary travel restrictions on seven Muslim-majority countries and suspending refugee admissions for 120 days. The executive order has been repeatedly revised in response to court challenges. 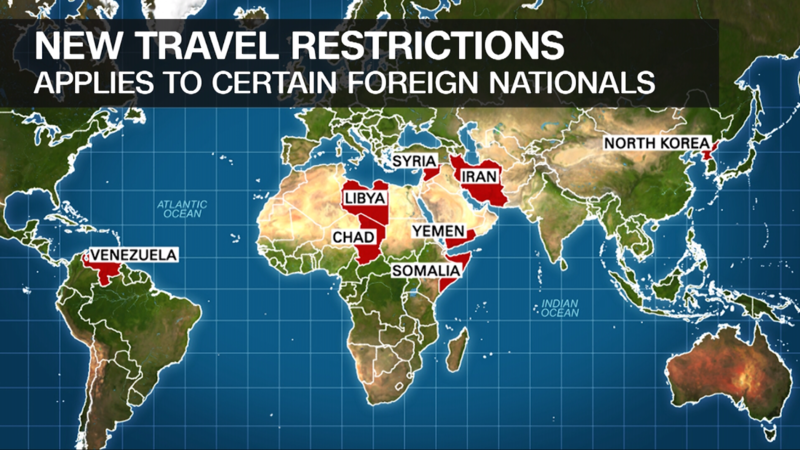 On Wednesday, the new iteration of the travel ban goes into effect. People from eight countries -- six of them Muslim-majority nations -- will either be prohibited from entering the United States or will face enhanced background checks. The Trump administration says the policy will keep Americans safe from terrorism. But plots like the US Project illustrate the complexity in combating ISIS and other jihadist organizations. The travel ban would not have stopped the conspirators from coming to the United States. None of them are from the travel ban countries. Abdulrahman El Bahnasawy is a Canadian citizen, Haroon is an American citizen living in Pakistan and the Russel Salic is from the Philippines, according to court records. Federal law enforcement foiled the plot in 2016. The undercover FBI agent posed as an ISIS sympathizer and recorded their communications. El Bahnasawy, the Canadian, was arrested in New Jersey and pleaded guilty last year while the two others have been detained outside the US and are awaiting extradition. There have been no domestic ISIS attacks carried out by individuals from the travel ban countries since the Supreme Court allowed portions of Trump's executive order to be implemented in June. Does that mean the policy has reduced the domestic terror threat? In fact, since 1975 there hasn't been a terror attack that cost US lives on US soil by someone from one of the original travel ban countries, according to a study by the libertarian Cato Institute. But this CNN analysis is concerned specifically with ISIS-related arrests, in particular after the travel ban was enacted. The cause-effect relationship is unclear. About 91% of the people arrested for ISIS-related offenses in the US since 2014 have been American citizens and immigrants/visitors from non-travel ban countries, according to a review of DOJ arrest announcements and court records. The deadliest domestic terror attacks in the past four years -- shootings in Orlando and San Bernardino -- were carried out by two American citizens and an immigrant from Pakistan/Saudi Arabia. Neither country is on the travel ban list. We looked back at ISIS arrests in the US since 2014 to assess whether restricting travel bolsters national security. Our focus was ISIS because the president first advocated travel restrictions for Muslim countries after the ISIS-inspired San Bernardino shooting. Trump says the new rules will make America safer. A review of federal court records and Justice Department documents, supplemented with news reports, paints a much more nuanced picture. We looked at case files for 114 people who have been charged with ISIS-related offenses in the United States since 2014, the year the terror group seized vast swaths of Iraq and Syria. Out of 114 arrestees, seventy-six are American citizens, according to court records and DOJ press releases. Another 21 people are naturalized citizens, legal permanent residents or visitors from countries not included in the travel ban. 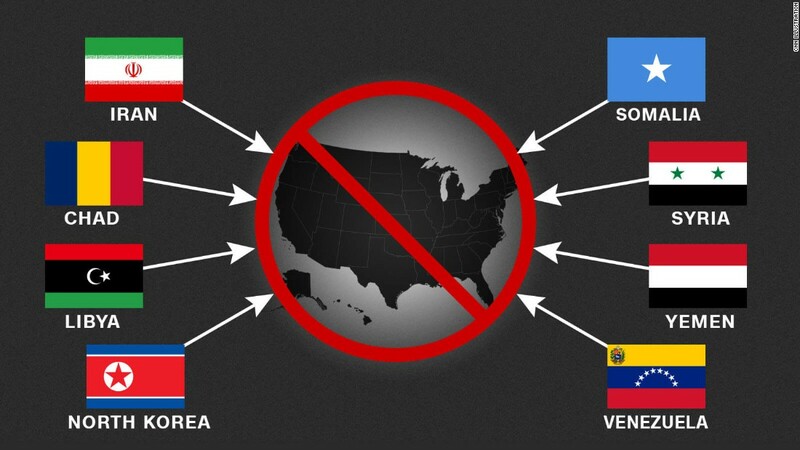 Four are undocumented immigrants from non-travel ban countries. Citizenship info was unavailable for four arrestees. Three refugees have been arrested -- two from Bosnia and one from Iraq, which has been removed from the original list of travel ban countries. Six arrestees are naturalized citizens or legal permanent residents from travel ban countries who came to the country long before the ban was in effect. Three are from Somalia, two are from Yemen and one is from Syria. Court records show no ISIS arrests for people from the other five designated countries: Libya, Iran, Chad, North Korea and Venezuela. Five of the six individuals from travel ban countries were caught trying to leave the United States for ISIS territory or helping others make the trip. The sixth person, a naturalized citizen from Yemen, is an alleged ISIS recruiter who also reportedly plotted to kill US troops in America. Under a plea deal, the attempted murder charges were dropped and the man was sentenced to 22 ½ years in prison for supporting ISIS. The most common criminal charge for alleged extremists is providing material support to a foreign terrorist organization. Individuals who make plans to go overseas to join ISIS can be charged with material support because, technically, they are providing personnel to the terror group. More than 56% of the 114 ISIS suspects have been arrested for plotting to send fighters, money or tactical supplies to the terror group's self-declared caliphate in Iraq and Syria, suggesting the US could be exporting more to the ISIS fight than it is bringing in. About 34% of cases are rooted in domestic terror threats. Some ISIS supporters are accused of planning nail bomb attacks or mass shootings but others have been arrested for retweeting ISIS propaganda and making threatening statements online. The remaining cases, about 9%, center on obstruction of justice, which can mean lying to the FBI about social media posts or past travel. According to court documents, the FBI often finds ISIS suspects via Facebook and Twitter, examining accounts that glorify the terror group. In order to distinguish between Internet fabulists and dangerous individuals, the agency conducts sting operations with paid informants and undercover agents posing as ISIS supporters. This has led some defense attorneys to claim their clients were entrapped. In one case, an undercover agent pretended to be a 19-year-old Muslim woman, sending flirtatious messages to a Michigan terror suspect that implied she wanted to be his ISIS bride, according to court records. At one point, the man said that he purchased rope to hang himself and the undercover agent responded that the only proper way for a Muslim to commit suicide is through an act of jihad. Although court records show the man discussed shooting people at a local church in the name of ISIS, the sting failed to yield a terrorism charge against him. He pleaded guilty to gun violations and was sentenced to five years in prison. The threat of ISIS in the United States is not theoretical. There have been five major ISIS-inspired attacks since 2015 in which the perpetrators were killed by police, including the Pulse nightclub shooting and the San Bernardino massacre. Out of the seven assailants who carried out the attacks, five were American, one was an immigrant from Pakistan/Saudi Arabia and one was a refugee from Somalia. Police killed him after he plowed his car into a crowd on the campus of Ohio State University last November, injuring 11. The travel ban would, indeed, have kept him out. But for all the fears about terrorists hiding among civilians fleeing war zones, Ohio State was the only domestic ISIS attack carried out by a refugee from a banned country in the past four years. Since Trump took office in January, the United States has not been hit with any domestic attacks clearly linked to ISIS. Was Trump's election the beginning of the end for ISIS in America? Actually, a decline in arrests took root during the final year of the Obama administration. In 2016, the number of ISIS arrests fell 55% compared with 2015. Arrests dropped from 60 in 2015 to 27 in 2016. In 2017, there have been 14 arrests so far. This correlates with a reduction in ISIS power and territory globally. According to RAND, at ISIS' peak, it controlled 105,869 kilometers of territory in Iraq and Syria. By early 2017, this was reduced to 45,377 kilometers, a 57% decline. Funding has fallen from $81 million a month in the second quarter of 2015 to $16 million a month in the second quarter of 2017, an 80% drop. Airstrikes killed at least 75% of ISIS fighters in Iraq and Syria between 2014 and 2016, according to US officials. Although ISIS was on a downward trajectory before Trump took over the White House, he has repeatedly touted his administration's accomplishments. In July, he tweeted, "ISIS is on the run & will soon be wiped out of Syria & Iraq." In September, he took another Twitter victory lap, "We have made more progress in the last nine months against ISIS than the Obama Administration has made in 8 years. Must be proactive & nasty!" His ISIS boast came minutes after he sent a tweet suggesting that the travel ban should be expanded to protect Americans from foreign terrorists. "The travel ban into the United States should be far larger, tougher and more specific-but stupidly, that would not be politically correct!" FBI Director Christopher Wray recently told lawmakers the threat of ISIS remains very real in the US. But defeating ISIS isn't simply a matter of stopping domestic plots and taking back territory overseas. It will require an examination of why the terror group has attracted adherents in the United States. Wray himself has acknowledged the complexity of the fight against ISIS. "We continue to identify individuals who seek to join the ranks of foreign fighters traveling in support of ISIS, as well as homegrown violent extremists who may aspire to attack the United States from within," he told a Senate committee. CNN's Mary Rose Fox contributed to this report.